Did Sexist Men Make Education Better? I’m gonna be upfront here. Don’t read this if you are faint of heart or can’t handle true things. There are gonna be things called facts strewn about and they may hurt. I remember awhile back tellin’ my wife that I thought she was one of the reasons that our education system isn’t doing as well as we would like. I had to walk home, but I have my reasons. You see, in the “old days” women really were discriminated against in the workplace. Many occupations and jobs simply weren’t available to women. And so it was that our best young women who wanted to enter the job market, as it were, entered it as a teacher. And they were great. But then a funny thing happened on the way to work…women achieved more and more gender equality until…whammo! The whole of the working world was open to them. And guess what happened? Until a few decades ago, employment discrimination perversely strengthened our teaching force. Brilliant women became elementary school teachers, because better jobs weren’t open to them. It was profoundly unfair, but the discrimination did benefit America’s children. … 47 percent of America’s kindergarten through 12th-grade teachers come from the bottom one-third of their college classes (as measured by SAT scores). 47% come from the bottom 1/3. Jeepers! As women were more and more able to compete in the market place for excellent jobs, they left teaching. 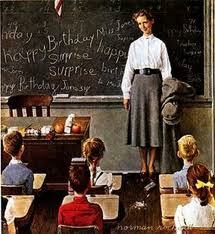 And with men, and now women, working to land that “dream job”, the role of filling the job of teacher fell to the …. well, it fell to the lowest performers. Now, to be sure, this is a general statement. Certainly top students enter the teaching profession. I, personally, have many friends and family that are fantastically smart and have become teachers. But the fact is that we’re losing our best and brightest to other professions. And no matter what happens in Wisconsin or Ohio or Illinois or wherever, we need our best. And our brightest. To want to become teachers. This entry was posted in Economy, Education, Politics: National and tagged Equal Opportunity, Sexism, Teachers. Bookmark the permalink. You’re right. What existed before was that because women were discriminated against they were willing to work at a wage below what they could earn if the market were truly open to them. It would be the equivalent of a diamond miner whose government said he had to sell diamonds to the government at a rate far below market value. Now women have open possibilities so if we want quality teachers then we have to pay what the market value of that talent is. Add to that the new demands placed on teachers, often making them work much longer hours than should be necessary to meet state or federal requirements, some even augmenting meager classroom supplies with their own contributions, and even the good ones can burn out. What existed before was that because women were discriminated against they were willing to work at a wage below what they could earn if the market were truly open to them. Yes, the pay was depressed because women had fewer career options. However, the quality was higher because women had fewer career options. I think hours are down, not up. some even augmenting meager classroom supplies with their own contributions, and even the good ones can burn out. Yeah…that’s nonsense. I don’t think teachers should be paying out of pocket for anything related to “supplies”. I remember finishing high school and trying to decide on a college major at GMU. At first I thought I wanted to be an elementary school teacher, but I wasn’t impressed with the salary for that profession. My dad suggested I might want to go into journalism. I did love to write at the time. I eventually declared a psychology major, but ended up in the banking business. One thing I’m glad of: that I didn’t end up a teacher OR a journalist. I’d have been miserable and would have eventually left for all of the liberalism and ridiculous political correctness that runs rampant through both of those professions. Oh, I’ve run into my share of liberals at my other jobs, but there’s no pressure to conform to their thinking or you’re ostracized, etc. One thing I’m glad of: that I didn’t end up a teacher OR a journalist. I agree. I ranked salary as higher on my compensation list that job satisfaction or value. During that one year I taught, there were several moments of pure grace….moments that I’ve never achieved in the 20 years since. But I make more money now than I would have. It’s a trade off; grace and love of job or less love of job and salary. One thing I’m glad of: that I didn’t end up a teacher OR a journalist. I’d have been miserable and would have eventually left for all of the liberalism and ridiculous political correctness that runs rampant through both of those professions. A Harley biker is riding by the zoo in Washington , DC , when he sees a little girl leaning into the lion’s cage. Suddenly, the lion grabs her by the cuff of her jacket and tries to pull her inside to slaughter her, under the eyes of her screaming parents. The biker replies, “I’m a U.S. Marine and a Republican.” The journalist leaves. P.S. Welcome to ConClub, Pino. Happy to have you join our ranks. Thanks. Happy to be part of the community!